A few months ago, after he read a Q&A with an alumnus (the one featuring Michael Spory), Eastern Mennonite University’s assistant director of auxiliary services and box office manager Lynn Veurink suggested that we similarly feature EMU staff in an occasional spotlight series – as “a cool way to get to know more about our colleagues and maybe open up some doors for future dialogue and conversation.” For example, he said, if he read that someone else here was also from South Dakota, he’d want to connect with that person. Here’s the first spotlight – featuring Veurink himself. I always wanted one, but nothing ever really “stuck.” That said, as you can probably imagine, having been given a predominantly female first name, I went through many years of “Linda,” “Lynette,” etc. through elementary school. :-) Haven’t really forgiven my parents for that one. 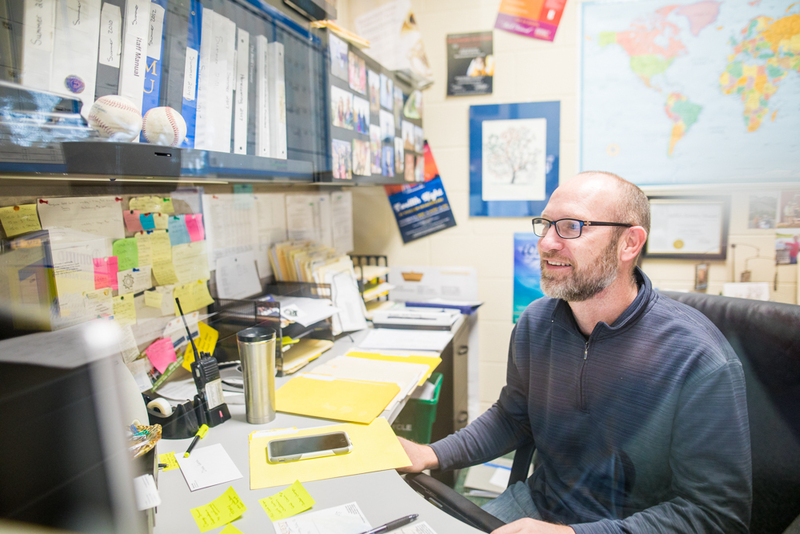 Lynn’s job in auxiliary services brings him into contact with many visitors to EMU, “summer-month strangers” who have become friends, he said. I graduated from Dordt College in Sioux Center, Iowa, where I double majored in biology and environmental studies, as I wanted to work in wildlife management. I did a lot of seasonal contract work in this field, but wasn’t ever able to land anything full time. I went back to school as a non-traditional student and got my secondary teaching licensure, and went into environmental/conservation education with the North Carolina Wildlife Resources Commission. It was during those years of teaching that I discovered I was pretty good with work involving logistics, organization and details, which has really served me well in my roles at EMU. Although I don’t have any great aspirations or a career change in mind, in May I will graduate with my master’s degree in organizational leadership from EMU. My point is this: I really enjoy learning, but we don’t always know where God is going to take all that learning. Over the years, I’ve come to realize my own plans and pursuits aren’t always what God had in mind for me – and I’m ok with that. Well, it began in the summer of 1993 in Michigan at a place called Au Sable Institute of Environmental Studies, where I met a fellow female student who said she was Mennonite and went to school at this place called Eastern Mennonite College. I had never heard of Mennonites, so I was somewhat leery. Nonetheless, I wooed her with some charm and then told her a big fat lie that got my foot in the door. (That’s another story entirely, but it is a good one). Next thing I knew, a year later I was marrying a Mennonite girl. 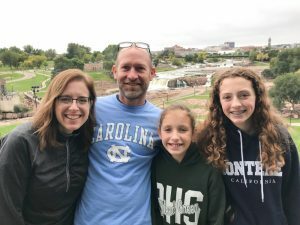 We’ve lived in Pennsylvania, South Dakota and North Carolina, and moved to Harrisonburg in 2007 so that our children could be near one set of their grandparents. I didn’t even have a job when we moved here. Soon thereafter, I was fortunate enough to be hired on as a grounds person at Facilities Management. That summer I noticed all the different conferences and camps taking place on campus and I thought to myself, “I bet there is a lot of logistical and detail-oriented work that goes into hosting these groups. 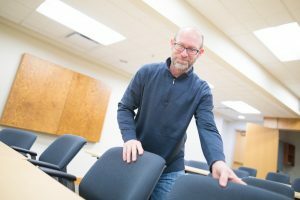 I should look into that sometime.” Seven months later I was working in Auxiliary Services, the office here on campus that coordinates all those conferences and camps. I now call a lot of those summer-month “strangers” my friends. I have been married to my wonderful wife Mary Jo ’94 for 24 years. She is much more patient and wise than I am. We have two polar-opposite daughters, Anna (15) and Ruby (11). As you can guess, I’m pretty well versed in just about anything female related. On a more serious note, we are really just your average ordinary family – not too many bells and whistles, when it comes to us. We’ve been fortunate enough to surround ourselves with numerous different friend groups, and feel blessed in that regard. I love to hunt and fish, and just wish I had more time (and money) to devote to it. I’m also a “birder.” Feeding and watching birds provides a sense of peace and calm for me. I grew up on a farm, so I love to play in the dirt – I enjoy landscaping, gardening and preserving our own food. I also appreciate my church family at Grace Mennonite Fellowship, and serve in various roles there whenever I can. And finally: Which of the following about Lynn is a lie? I played high school basketball in the world’s only Corn Palace in Mitchell, South Dakota. I built my own wooden canoe and paddled it the entire length of the Missouri River through South Dakota. I cut off the end of my big toe while working here at EMU during the summer of 2009. A work study student drove me to Emergicare and videoed the doctor sewing it back on. Wonderful to learn more about you, your history, and your family in this article, Lynn! Thanks for sharing!